Interests:I am a geologist/geophysicist by education and a dredger and detectorist by heart. Recently moved from NC to Colorado with my job. Looking forward to finding lots of Rocky Mountain Gold!! Too cold to fish last weekend, so my wife and I took the boat out to a remote location to see if we could locate a few pre-historic sharks teeth and other fossils that our area is known for. We searched on the oyster banks and in the shallow surf for around two hours at low tide and found an assortment of sharks teeth, crocodile teeth, misc. mammal bones, etc. Years ago, there was a phosphate mine in this area which dredged up tons of these fossils. Now after large shifts in the tide, storms, several really windy days in a row, etc. you can go out to remote locations near the old plant and really rack up. 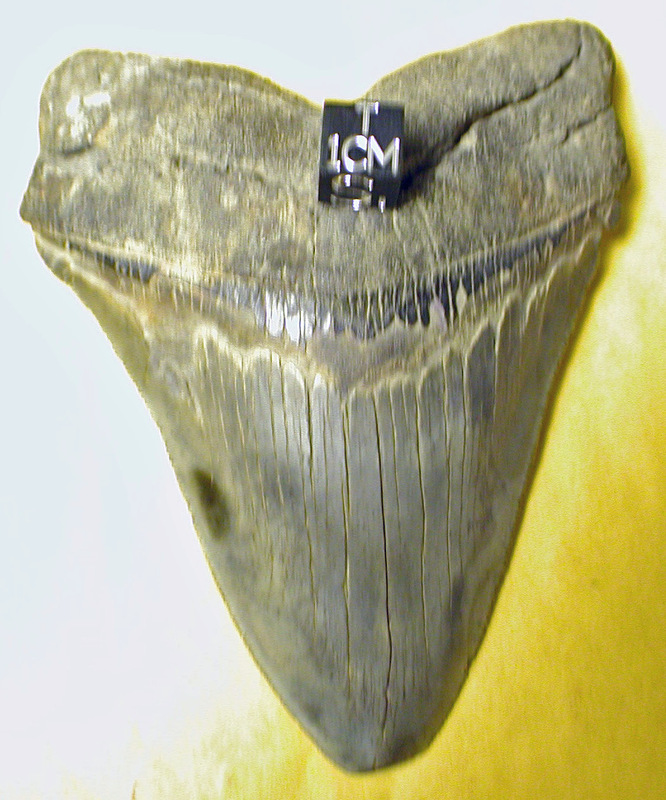 Some 6"-8" megalodon teeth are found on a regular basis. Here's a photo of some of the ones that we found. That is TOO COOL! I have heard of finding sharks teeth but have never found any. I have found fossilized sea urchin spines and all sorts of neat diatoms and shell life in areas but never a shark tooth. Are there spots away from the ocean that have these things? Bob, these were found just inside the sound, about 3 miles inside the sound from the ocean. We have really large tide fluctuations here (8-10 feet) between high and low tide. We get in the boat around an hour or so before low tide, and travel down toward the ocean from where all the dredging from the old phosphate mine took place. I just look for places where the substrate is hard (hard sandy bottoms vs. pluff mud), then you look for areas in this hardpan bottom where the tides or wind/wave action has concentrated the heavies (sharks teeth, fossils, etc. )like gold in a a sluice riffle. 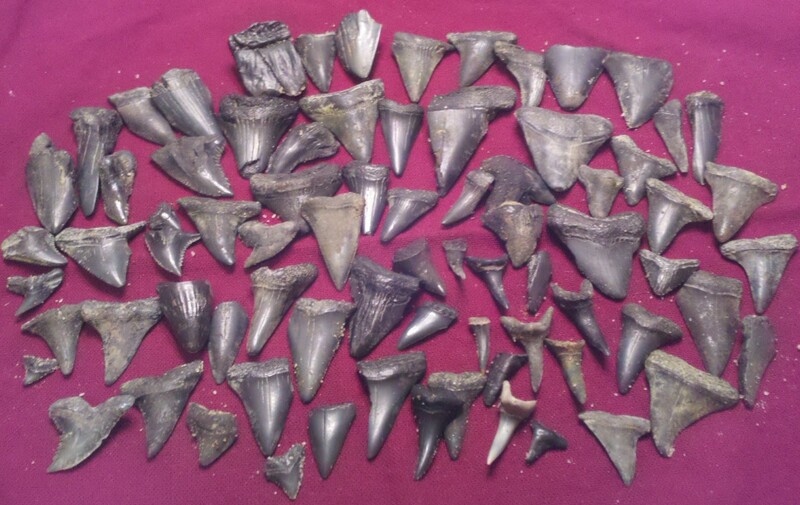 You will find sharks teeth, fishing weights, old metal, indian arrowheads,and phosphate nodules, etc. all heavies that are concentrated together. Most sharks teeth will be concentrated in places like this. There have been some HUGE ones found here. I saw a guy come out with a perfect 8" megalodon tooth a few weeks ago. Anyway, we put waders on and look in around 2-3 feet of water (which at high tide would be in 10-15 feet depth. The group of teeth in the photo were found in about a 2 hour period. There is a mastodon tooth (upper middle, and a crocodile tooth, lower left third....so I have been told) in that photo. They find whale bones and teeth, mammoth bones and teeth, and all kinds of other stuff. 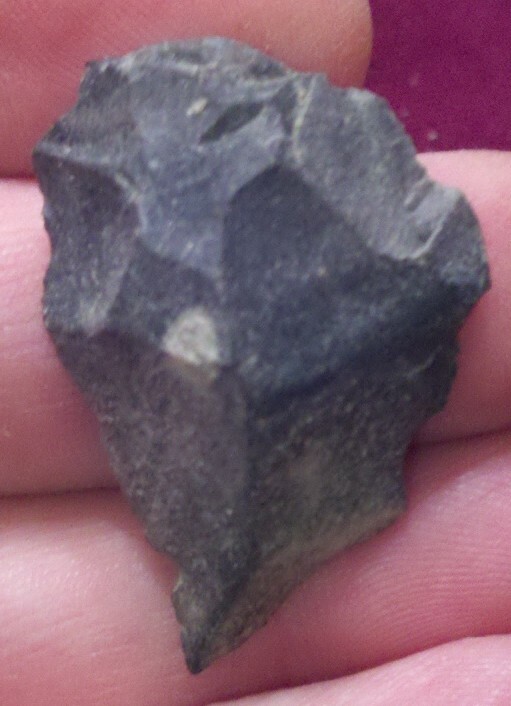 We also find some native american artifacts as well. I will post one below that was found last week during our shark teeth hunt. Those are some great finds ...Thanks for sharing WOW! Interests:Reading, metal detecting & enjoying the great Colorado Mts. When I was in school in Colorado Springs we took a field trip to a ledge where we chipped out shark teeth, not as big or nice looking as rluckadoo's + some other sites for other fossils. It was a fun trip as a kid. Now day with the greeny whinies taking away every thing you probley can't do it any more...............Those were the days ! By the way nice collection rluckadoo. Interests:Geocaching, metal detecting for gold,hidden caches, and meteorites. Taking pics of the Desert during Sunrise/Sunset is also a passion of mine. Man, that is awesome finding that many in one spot. I found one a couple of years ago while working on a project taking pics of Native American Artwork in Utah and I thought I struck gold. For sure I would not want to meet one of these guys while in the ocean. Aloha and thanks for the pic. Interests:Meteorite hunting, metal detecting for meteorites/gold, drywashing. Those are some cool finds. Congrats! Hmmmm... something stinks right now! There are some good places on the Ashley River , up behind the old plantations...MAGNOLIA , MIDDLETON AND DRAYTON HALL. I have found a lot of the big ones there. Actually, by the way the crow flies, we were not that far from where you were talking about. Google "St. Helena Sound" on Google Earth and you will see the area we were in. The tides are supposed to be perfect for looking for shark's teeth and other fossils this weekend. I will give you a report on what we find. If you get down to SC, look me up and I will take you out to find some. We can fill a bucket in a few hours if you find the right spot where they are concentrated. Actually, one of the big hobbies here locally is to dive into deep holes to look for them with scuba gear. The visibility is zero and you just go down and feel for them with your hands. I have seen some awesome collections! The really huge teeth, 6"-8" are found deep (except for an occasional lucky guy, like the guy I saw last week who found one out of his kayak near where I was searching). 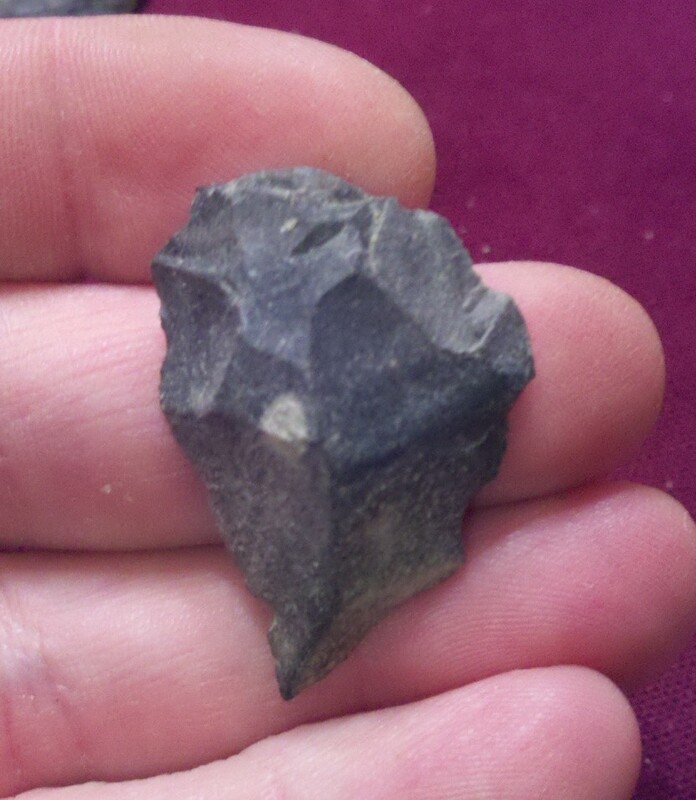 You can find some really nice arrowheads, spears, tools and points in these areas too! I lived and worked for a time in the town of Gove Kansas up in the N west part of the state. This area was ocean at one time and is now low hills of sandstone. I collected teeth there very similar to Rluckadoo's, My collection was not as impressive but I wish I could find and post a photo of it. The sandstone was also embedded with an amazing variety of fish species. A few very big fossil fish skeletons were laid out on the surface with vertebrae the size of a can of tuna. Judging from the size of some of the teeth much larger monsters must be laid out below. I only tried and succeeded in excavating one fish, a small puffer fish, a perfect fossil fish mounted on it's sandstone resting place. Woe and misery on me! I cannot find either the teeth nor the fish. Keep and guard what you have Rluckadoo. It is special. Thanks Del for pointing out my pic of the wrong tooth. Must be old age catching up to me! Looked at my tooth on my cabinet and saw that my note said that this one was actually found at my Sisters Convent in Encino. My tooth I found in Utah was taken from me when I finished the hunt since all the fossils had to be turned in. Wish I had taken a pic of that one and kept it along with this one. Oh well, at least I kept the gps coords. Here are a couple I found in Florida a few years ago.......about 50 miles from the coast! I have found some in the sea cliffs just North of Drakes Bay, Calif. Here around Reno, Nv. you can find molusk shells but they are fresh water. Use to see many large shells around the south side from Randsburg but I have not seen one there in a while...Lasdt one i saw was broken to pices be whom ever saw it before me. A shame since they was always very large about 5-6" across. Wow that looks like one of those Megaladon teeth, I've found a few...on eBay, but didn't know you could find them in UT, whereabouts were you located when you found it? That being said there a few people that do this to find those big teeth, after the first time for me doing it, I won't do it again, too spooky, you can also find them on some of the banks of the channels where they dredged the channel and deposited the material, but you only get to hunt this material after the "State Archeologists" get most of the good stuff and then the area is opened too the public to check out, there are also many smaller teeth of all kinds as well in the dredge material, it is not usual to find 100 or more teeth mostly smaller ones in a 2 to 3 hour hunt if you have your eyes "Tuned" to see the teeth in amongst the other bits shells and fossils. I picked up a couple on eBay in the past, it seems lots of them do come from the southeast, GA, SC, FL, etc. This sounds like noodling that's done here in Missouri. Yes Steve it sorta like noodling, but it's mostly done in the river channels near the mouths of the rivers and not too far from the open ocean and the critters that are bumping into you are usually sharks, the good thing is most of them are not "man eaters" and realize you aren't what they would rather eat. 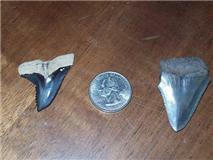 very cool sharks teeth, I hunt here in bakersfield for them around shark tooth hill. Miocene epoch, but I get to stay dry lol, would just love to do what you do some day. This stuff here will kill ya in the summer and its getting harder to dig here for several reasons but enough about me, great finds.